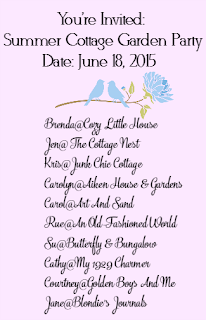 Today I am participating in Brenda's Summer Cottage Garden Party. Please take time to look at my summer gardens post and then hop over to see the other 9 beautiful and inspiring gardens. 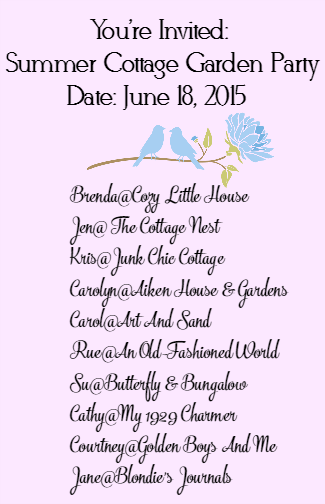 We have to thank Brenda for getting all these wonderful bloggers together to share their wonderful garden spaces. Besides all the flowers in the garden I love to add a bit of unusual whimsy by adding architectural salvage in with my garden decor. 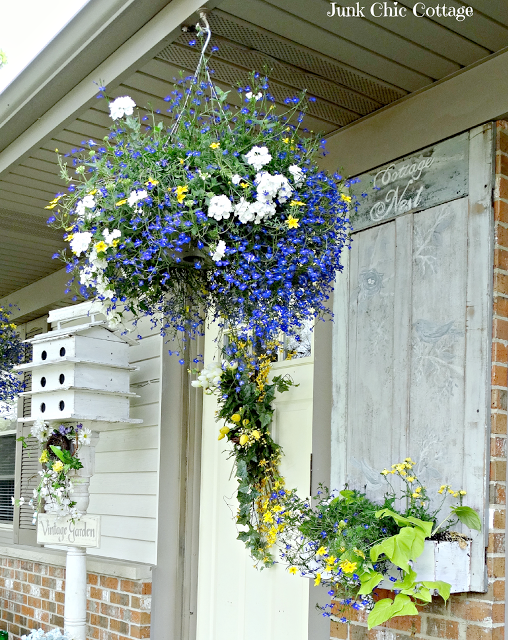 I had this old painted door and added an old drawer to make a flower box at the bottom. Chippy and fun and gives some whimsy to the garden. 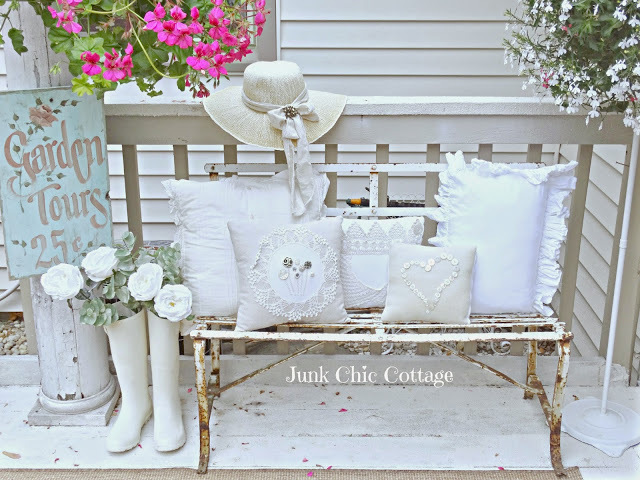 An old vintage wren house put on an old porch post give some white and chippy fun to the decor. This old barn door made into a potting table adds some color and also a space to re pot flowers and store garden watering cans. 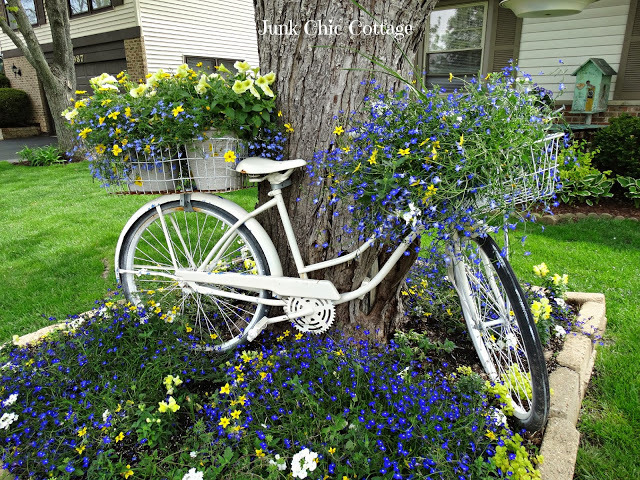 My favorite piece in my summer garden is my two bikes filled with flowers. I have this one in the front of the house and one on the back deck. This is the back deck old vintage garden bike. Old bikes with flowers in the garden give a fun look. My back deck is truly a summer sanctuary for me. We have a small table out there for having the perfect summer evening El Fresco dinner and of course my summer lounger a perfect spot for reading and soaking up that wonderful summer sun. 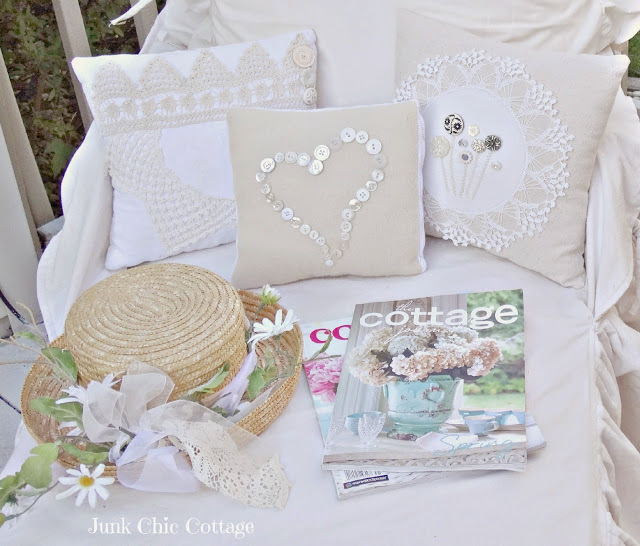 No summer reading spot is complete without a cute garden sun hat and lots of pretty pillows and wonderful cottage magazines. 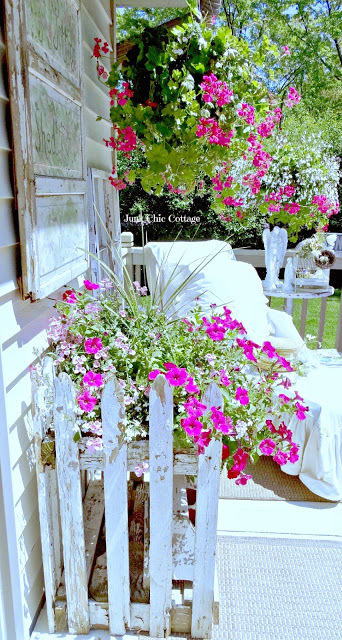 This old white picket cottage fence made for a great potting table out on the deck. On a nice sun filled day I will bring out my cute summer pillows and add them to my bench and lounger. Love the soft and comfy look they give in the garden. 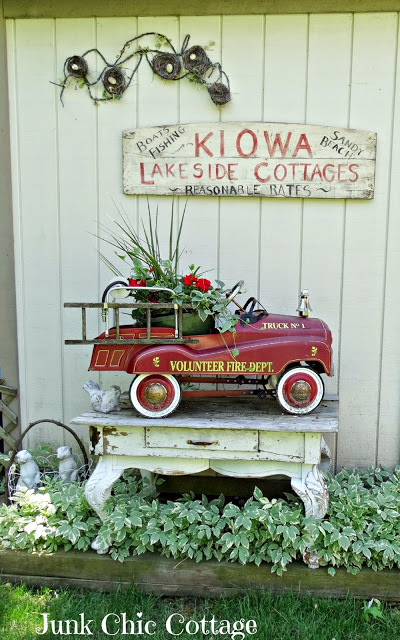 As many of you know my husband is a fire chief so I added a little whimsy by his shed this summer. It was fun to share some of my summer garden spots with you on this lovely tour. Be sure to visit the others and see all the wonderful inspiration. Your garden is always a joy to look at, Kris. You must spend a lot of time relaxing among all that pretty! You have such amazing style! Love your beautiful garden! I love it all! Your gardens are beautiful. Your gardan is beautiful! I love architectural pieces in a garden and am slowly adding in a few. They give it so much interest. Love all of yours! I know I say this a lot, but your flowers are truly amazing! So lush! I like how you kept to a certain color scheme both in front and back. The little fire truck makes such a cute planter too. Well, you know I love your yard at any time. Today I noticed that chippy barn door table for the first time. Now I am trying to figure out where I could put something like that in my garden. What a wonderful garden and outdoor space Kris-Lovely! I want to lay on you lounger and sip lemonade and read a good book! Kris, you have such a knack for whimsical creativity! I've been pinning away, as I rarely miss a chance to pin beautiful scenes. What lovely outdoor spaces you have. Thanks so much for joining the party! Just loved the Pictures of your garden. It looks fabolous. Your outdoor spaces are so lovely and you've inspired me to put a table out front for potting. Love that! Your garden is so pretty. My favorites are the two bikes as well! What a beautiful garden setting you have created. It's all so pretty and inviting! If you find someone sitting out here you might be surprised to find out it might be me! Love you bikes and we have one out in ours too, add such charm. Maybe we'll be able to meet and chat in each others gardens. I want that old barn door....just saying! What a treat visiting your garden was! I love it. I always love to visit your beautiful garden. I especially am swooning over your chaise. So pretty and relaxing!! It looks so cute sitting up on a nested table in the yard taking on all the age it possibly can. 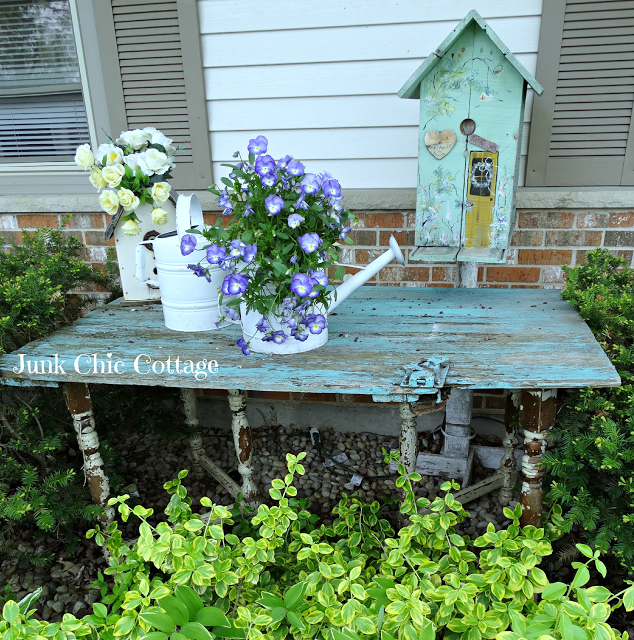 I love gardens like yours with salvage that adds to the cottage Chicness it's taking on. Your neighbors must be in awwww! As to the beauty you share, I know if I were your neighbor I would be snooping around with a chair up to the fence so I can take a peak when ever I wanted :))beautiful summer weekend to you. Kris, you know I love all the garden flowers, but I REALLY love all your salvaged pieces and how Terry's helped turn your vision into really cute and functional pieces. His corner is so darn cute too. Fun tour, happy summer! What a beautiful garden you've created Kris. I love all your vibrant flowers and all your vintage containers. Gorgeous!! Kris, your garden is just beautiful and oh my goodness, your flowers are gorgeous! 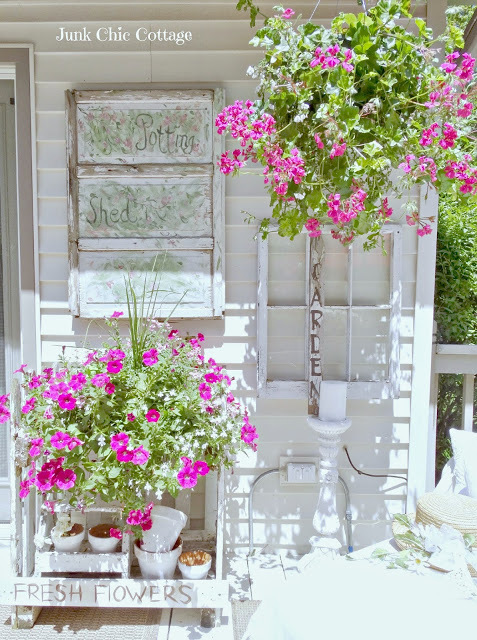 Your garden decor is just as charming as can be, love it all! I love it....esp the reading spot. Great job all the way around. Kris, your garden decor is just charming! I am really admiring all your salvaged pieces, your bikes, the signs, and especially the little firetruck for your husband! Oh my! I'm pinning and sharing such beauty! Hi Kris, lovely to see your garden again. So pretty and peaceful. 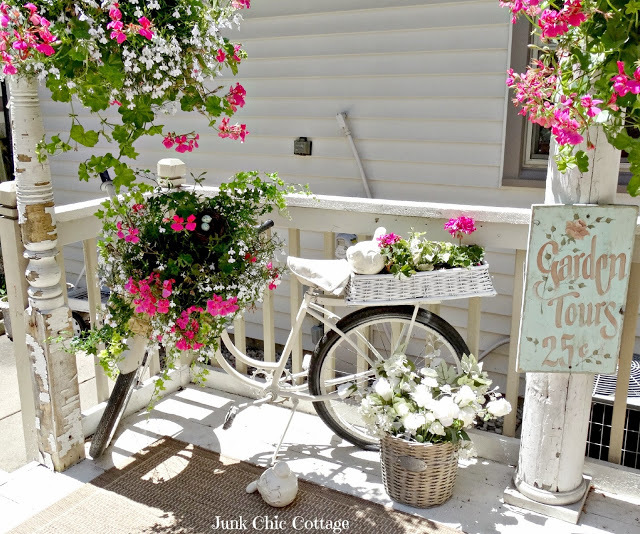 Love all the cottage charm it shares. Your place is a natural for a garden tour, Kris! So many adorable features. That chaise with the magazines would be where you would find me! I absolutely enjoyed my visit through your garden! Just wondering if you could tell me the name of the plant under the firetruck table, which is a great idea! I am not sure. It is a perennial and comes back each year. I think it is some kind plant maybe in the hosta family. Sorry I could not be of more help to you. It has always been growing here and I did not put it in. I enjoyed my tour through your lovely garden with lots of charming details. The chaise would be a great place to relax. Everytime you do a garden post I fall all over again in love with the romanticly cozy garden spots you creatively construct into outdoor rooms. Your use of architectural salvage makes me fall head over heels in love with their mixing with the flowers beds. 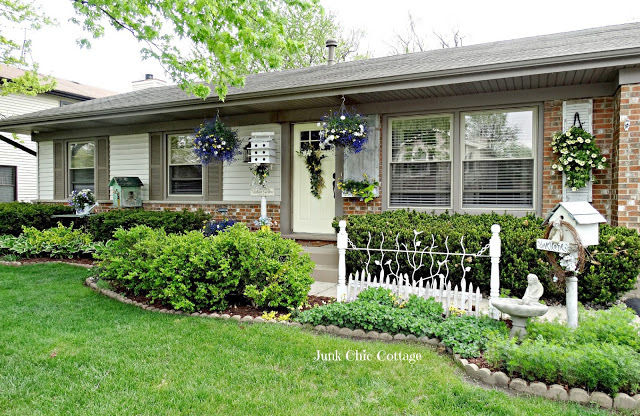 I adore your deck, the hanging baskets and your garden hats always on display that make us feel happy and hugged. Your gardens efforts pay off in a beautiful spot to linger and relax. Kris, thank you for the tour of your beautiful garden areas! 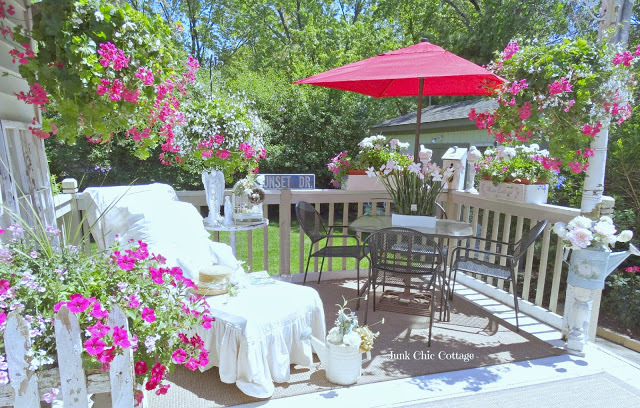 Everything is so gorgeous, charming and so well laid out....a place to relax and enjoy the weather during the summer months! Have a wonderful evening! The first time I saw your garden pictures, recently, I was almost stunned by the sheer beauty of everything. This time, looking carefully at the pictures, I couldn't help noticing some things that seem to make your gardens work. 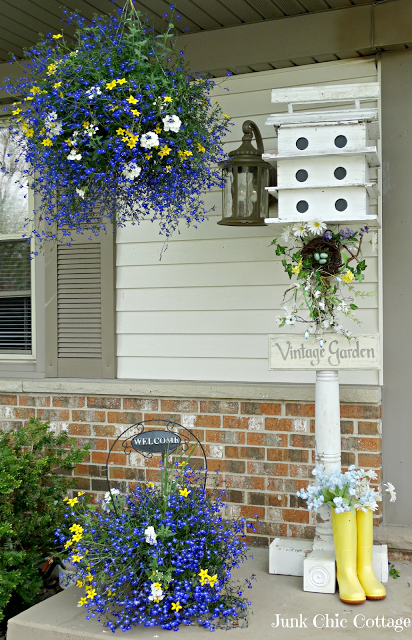 Using the blues and yellow flowers with some white, against the grays of your wooden shutters and that marvelous door that has the little flower box--just a marvelous combination of colors with the neutrals and the brick. 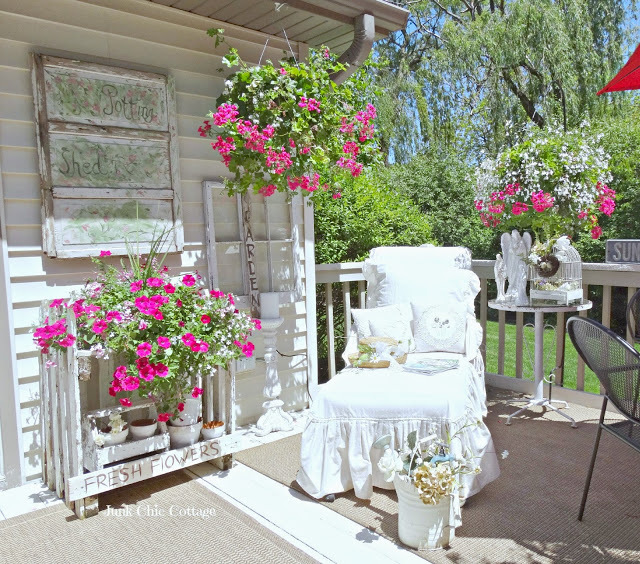 And then your lovely deck in back with all the whites and sticking with that glorious shade of pink for the flowers, perfection! You have such an eye for all of this! The two bikes make me giggle! I love how you made the old fashion bikes in an elegantly and brilliant way! Cheers! Everything is so beautiful!!! You have such an eye for decorating!!! Thank you for sharing!!! You have a most magnificent garden(s)....Filled with so much charm and whimsy...a true delight for the eyes...and I am sure that many cars that go by have to slow down to take in the beauty of your home and gardens!! !....Thanks for the tour Kris...I always enjoy seeing the gorgeous gardens you create!! !...Have a great weekend! I love your gardens and your back deck. Loads of beautiful eye candy vintage goodness and very welcoming. 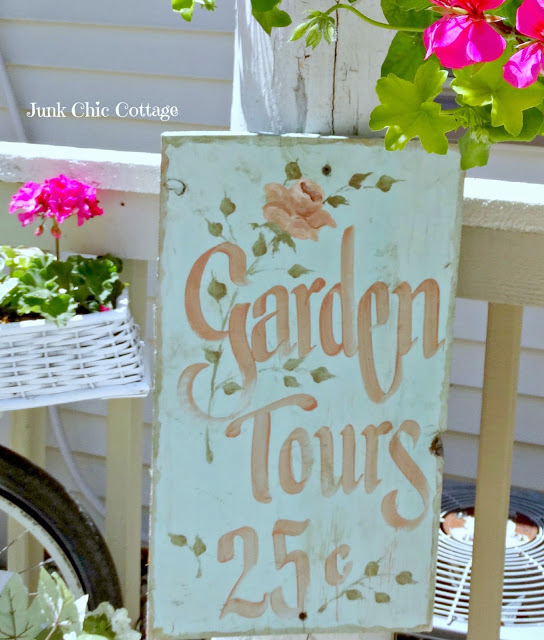 Thanks for sharing it with us in this garden tour Kris! Lovely garden! The barn door made into a potting table is my favorite! Enjoy your weekend! You know how much I love your home, inside and out! I am determined to have a soft cozy chaise like yours on my patio one day! Your pink and purple flowers are gorgeous and I love the lobelia, it's my favorite. I think the way you jazzed up Terry's shed is so charming. You rock!! Your gorgeous flowers must really make your home stand out in your neighborhood...you have to be the envy of the community!! Love your bikes and all of your wonderful architectural pieces. What a beautiful ambiance for dinner on your deck...better than a restaurant!! Just beautiful. I love your bikes, what a great idea. Kris, Your summer garden is so whimsical and fun. So many wonderful treasures to look out. Love the antique bikes!! Just beautiful!! Your backyard is so beautiful! You have maintained it in a magical way. Loved watching these pictures! Your garden party was rocking. Well, I am also going to attend an outdoor party at one of the prettiest Boston venues.